THOUSAND OAKS, Calif. — It’s only the preseason. His 12th preseason, mind you. But there was Andrew Whitworth, with his 6-foot-7, 333-pound frame, in a dead sprint for 80 yards, chasing Los Angeles Chargers defensive end Melvin Ingram as he scooped up a fumble and returned it for a touchdown in Saturday’s preseason game. 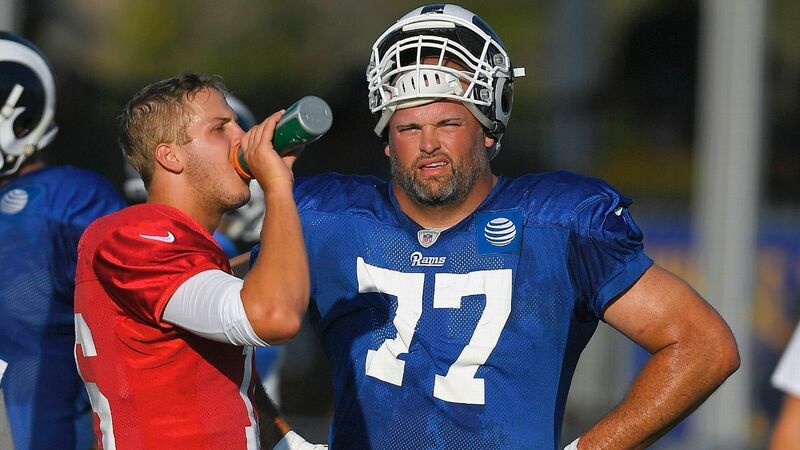 Throughout the summer, nobody has hustled more than the Los Angeles Rams‘ 35-year-old left tackle. Whitworth is the first Rams player on the field at the start of every offensive possession. He sprints to the huddle, then waits for the others. He began doing that as a rookie with the Cincinnati Bengals, way back in 2006, because they ran a no-huddle offense. Now he does it to set a tone on what is still a very young offense. “I think the way to maximize, not just your leadership but your ability to influence your team, is whatever you can do that helps the team perform at a really high level,” Whitworth said. “It’s not always just about how you can play here in the snap, but what you can do outside of the snap. If it’s hustling guys up, if it’s getting the tempo to be faster — anything I can do to help slow things down for Jared [Goff] and let him kind of handle the team the way he needs to handle it. The Rams brought Whitworth over on a three-year, $33.75 million contract that represented their biggest splurge of the offseason. He provided a significant upgrade over Greg Robinson on Goff’s blindside, but also a well-regarded and established leader. Whitworth is a three-time Pro Bowler who had already made more than $50 million in his NFL career before signing his latest contract. He can retire whenever he wants. But he’s still the first one to the huddle, and the last one after Ingram.